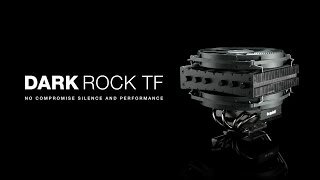 DARK ROCK TF silent high-end Air coolers from be quiet! One of the hardest things to do in a compact PC is quietly cool a high-performance CPU even in extreme overclocking conditions. be quiet!’s top-flow cooler Dark Rock TF offers a solution to this challenge. Featuring dual heat sinks with anti-vibration rubber inserts, six 6mm heat pipes with aluminum caps, two virtually inaudible Silent Wings 135mm PWM fans (max. 26.7dB(A)) with six-pole motor and fluid-dynamic bearing, and 220W TDP cooling performance, Dark Rock TF is a true cooling beast. Dark Rock TF offers the best performance-to-noise ratio for compact PC systems with absolutely no compromise in silence and performance. Thanks to its double-tower layout this cooler is a true cooling marvel with 220W TDP – just perfect for the extreme conditions found in the overclocked CPUs of compact gaming PCs. Dark Rock TF contains two nickel-plated aluminum heat sinks. Two fans are pre-installed, but a single fan assembly is also possible, offering further space savings and even quieter operation. The cooler is equipped with two Silent Wings 135mm PWM fans. They feature advanced fluid-dynamic bearings, smooth six-pole motors and nine airflow-optimized fan blades. The noise is a meager 26.7dB(A) even with 100% PWM fan speed. Dark Rock TF has six high-performance 6mm heat pipes with aluminum caps. They carry heat to the optimum location on the cooling fins. Anti-vibration rubber inserts on the cooling fins of the heat sink further dampen noise. The space-saving topflow design provides ideal cooling, not only for the CPU, but also for surrounding components. It can quietly cool a high-performance, overclocked CPU in a confined space.